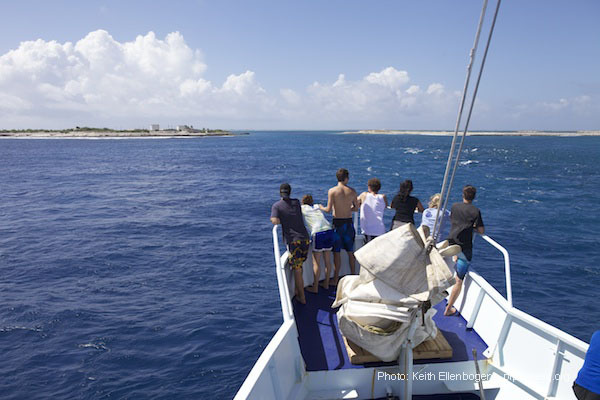 These images were sent in by expedition photographer Keith Ellenbogen at the expedition's first dive site, Kanton Island. The accompanying text was written by Randi Rotjan. 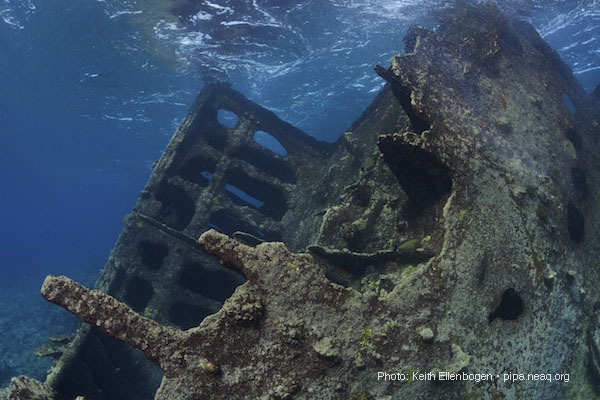 Kanton Island has a long history of shipwrecks. Indeed, the current island name itself (Kanton; originally Canton), was named for the wreck of the same-named whaling ship. The Canton was based out of New Bedford, MA and was at sea for two years (1852-54) before wrecking on the island in the midst of a tropical storm. The crew (all New England-based) survived via an epic adventure: they salvaged and repaired the smaller whale boats, rationed their rescued food and water, and set sail for the Gilbert Islands. Forty-five days later, starving and severely dehydrated, they landed on a small uninhabited rock with nesting booby birds in the Marianas; after getting some sustenance from the birds, they continued three more days to Guam, eventually returning to New England by opportunistically boarding other ships. The lengthy self-rescue became well-known, and eventually led to the re-naming of the wreck site to Canton Island in 1872*. Now, on this trip, the team visited a more recent wreck; that of the U.S.S. President Taylor, which was beached on Valentines Day, 1942. You can see a 1945 photo of the ship beached off of Kanton Island here. Though the ship is now below the water line, it is just barely so: note the surface in both photos! From a biological perspective, these shipwrecks are more than just interesting ghosts of past human activity. They also are a continual source of slow-released iron, which promotes the growth of the black scrubby algae you can see in the photos above. A recent study from the Line Islands entitled "Black reefs: iron-induced phase shifts on coral reefs" describes the change in reef communities with the addition of iron (which is normally extremely limited in Central Pacific waters. Specifically, the authors report: " Iron concentrations in algae tissue from the Millenium black reef site were six times higher than in algae collected from reference sites". These high iron concentrations also inhibit coral growth, as you can see in Keith's photos. 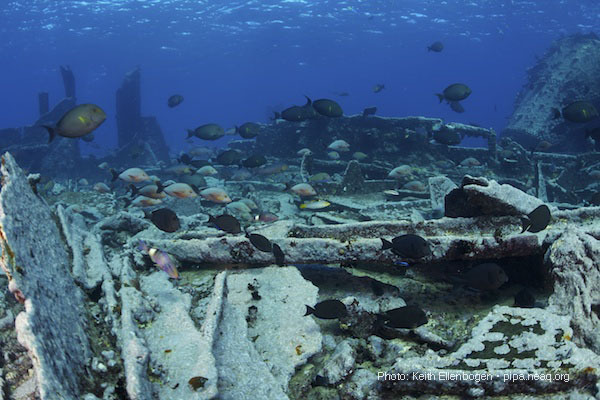 The ability to observe the biological impact of shipwrecks in iron-limited systems is rare due to the often overwhelming influences of other human impacts (typically recent or on-going, that dampen the signature of an old wreck). Opportunities to see these effects are part of what make the Kiribati archipelagos so special and unique. *Information about the Canton wreck summarized from: "Canton Island: Aerial Crossroads of the South Pacific", by Carl Oates. Stay tuned for another post later today with more photos and a description of the team's first dive.